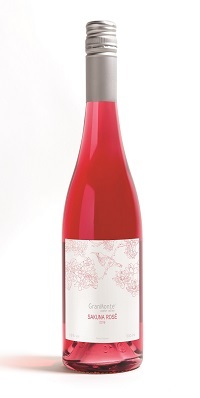 GranMonte’s Sakuna rosé is made with 100% Syrah grapes. We craft our rosé in the most traditional way: no mixing of white grapes and red grapes or white wine and red wine to make rosé! Syrah for this rosé was picked from fourteen year-old blocks of Syrah vines on a slope with deep red clay soil and good drainage. The grapes were hand harvested in the cool nights of February at 22°Brix to retain natural acidity. This wine is lively and refreshing. It shows confectionary nose of raspberry lollies, strawberries, fresh pineapple and nuance of cream. It is youthful with a touch of natural sweetness balanced by refreshing acidity. The wine has an attractive silky palate with long lingering finish. Sakuna rosé is perfect for apéritif and a great complement to flavourful Thai cuisine such as papaya salad, spicy soups, jungle curry and other coconut-based curries.